New to the CPA conference this year was the Resident Trivia Competition, an MIT executive board initiative. On September 14th at noon, teams of 3 to 4 residents gathered around cocktail tables in the exhibit hall, as curious crowds formed around them. Dr. David Goldbloom, Professor of Psychiatry at the University of Toronto, and author of “How Can I Help-A Week in My Life As a Psychiatrist”, hosted the event, with his unmistakeable enthusiasm and radio announcer’s voice. The multiple choice questions were tough, a combination of pop culture and examination-type questions. Tension mounted as teams deliberated which answers to key in. The competition was close! Thirty-five questions later, the proud team from University of Montreal became champions. The event was good fun and a great success, surely to be repeated at future meetings. So, be sure to sign up next year. In the meantime, here are two of the trivia questions. See if you can get the right answer. 1. In bipolar elderly, cycles of depression and mania become ___ frequent and ___ in amplitude. 2. What was the name of the fictitious, cold and heartless psychiatric nurse from the movie One Flew Over the Cuckoo’s Nest that was named the 5th greatest villain ever by the American Film Institute? The correct answers will be posted on the Resident Section of the Canadian Psychiatric Association Facebook Group. Team from Université de Montréal, champions of the 2017 Resident Trivia Competition. 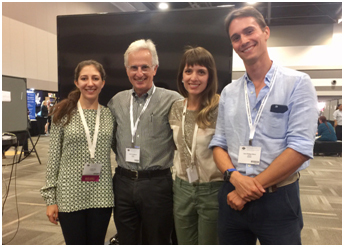 From left to right: Nadia Daly, PGY-4; Dr. David Goldbloom, Trivia host; Constanza Aguirre, 4th-year medical student; Jean-Philippe Miron, PGY-5.